Today’s post is a little late, but it’s worth it, I promise! 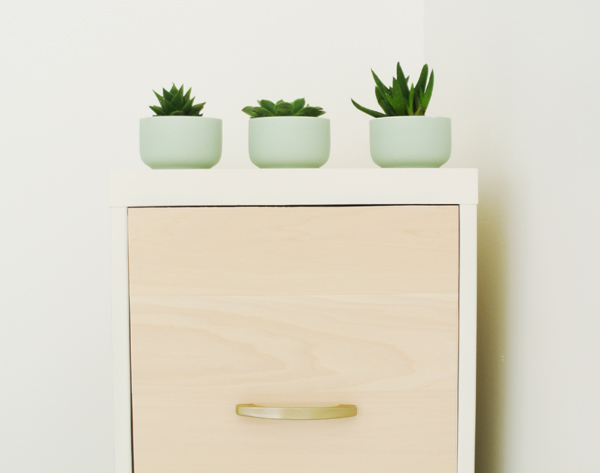 I am so excited to show you the DIY project we did for our new home office! You may remember that our theme for this room is white, wood and gold … aka, all of my favorite things. So we DIYed ourselves a filing cabinet that fits right in! 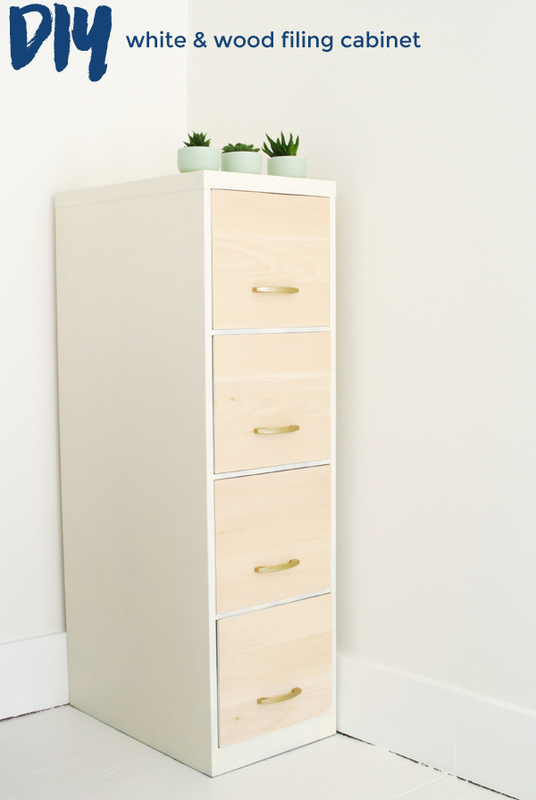 We started by removing all the hardware and spraying the whole filing cabinet Rustoleum Heirloom White, which is a warm, creamy, off-white spray paint. We didn’t bother spraying the drawers since we knew they’d be covered in wood, so we just sprayed around the edges that you could see. Then we covered the fronts of the drawers with thin sheets of bass wood. Our local craft store Pat Catan’s has these sheets in many different sizes, thicknesses and types of wood. They didn’t have sheets big enough to fit a whole drawer in stock, so we used 3 sheets per drawer, which I ended up liking a lot because it varies the wood grain and makes it more interesting. These sheets are great because they’re very thin, only 1/32″ thick, which is just about the thickness of stiff card stock, so they can be cut very easily with regular scissors — no power tools is my kind of DIY! And at just over $2 each, this was also an inexpensive project. 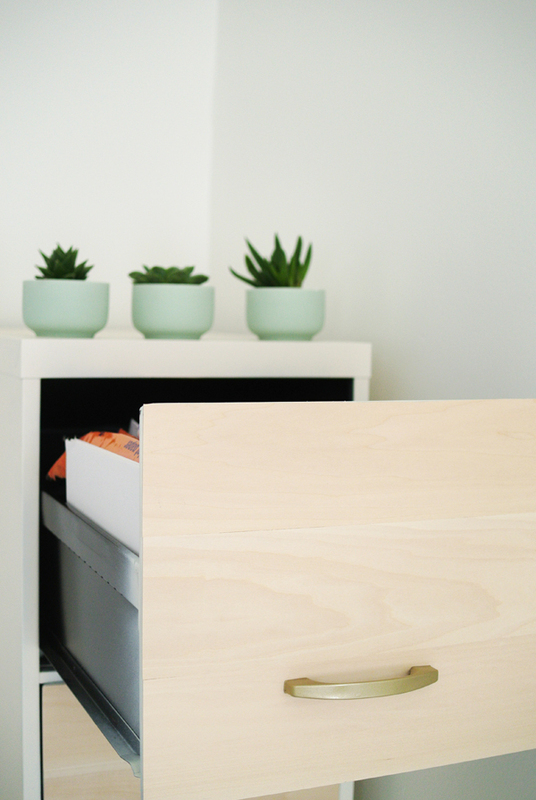 I simply cut each sheet to size, covered the back in E6000 Craft Adhesive , which is my favorite all-purpose permanent glue, and pressed the wood onto the front of the drawer. E6000 doesn’t dry super fast, so I had time to adjust the sheets before they dried permanently. 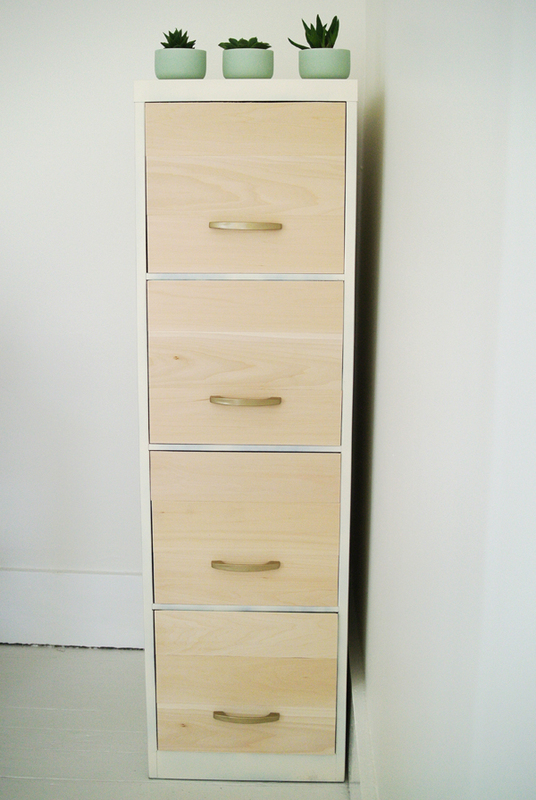 To finish, we spraypainted the filing cabinet’s original handles gold and reattached them by poking holes through the wood from the back and using the original screws. Voila, a 360-degree transformation from boring old rusty black, to a modern, fresh and new look that perfectly suits us and our office. It’s also really nice to finally have a place to store all of our paperwork and files. We have an entire drawer of just different kinds of printer and craft paper! And now, when we need to find an important document, there’s a whole drawer of labelled files. Phew. BTW, how adorable are these little bowls of succulents? 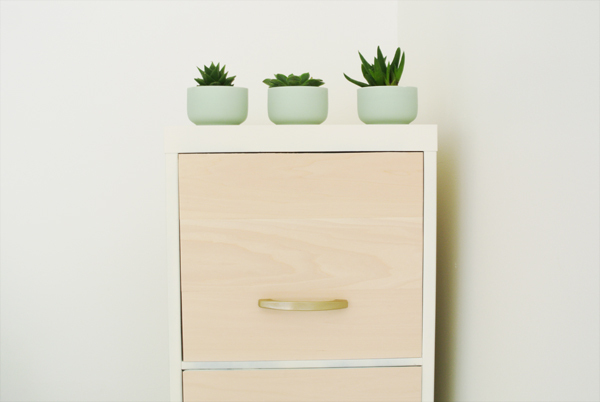 The mint mini-bowls are from CB2 and I think they’re just about the cutest thing ever. They also come in pink! 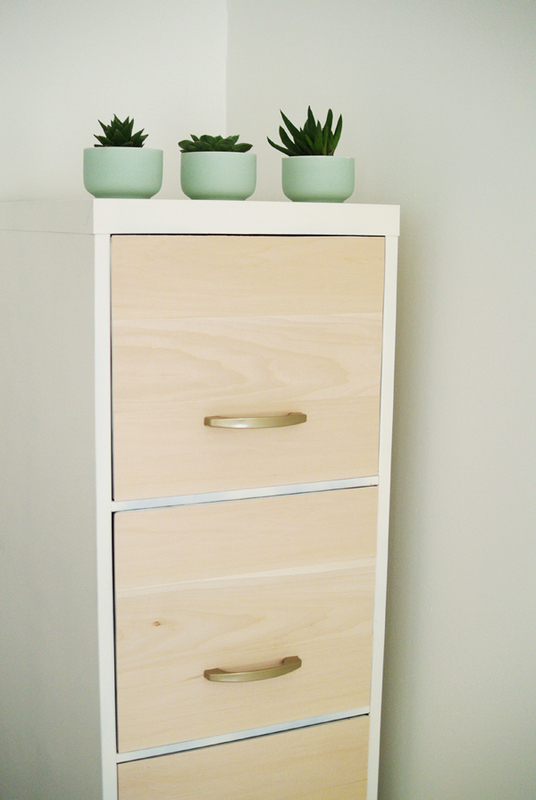 I think this new filing cabinet DIY has gone to the top of my “most favorite” list. What do you think? !